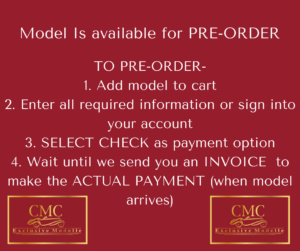 And another prize for CMC !Modellfarhzeug Magazine, awarded the “Oscars for model cars” in Berlin ! 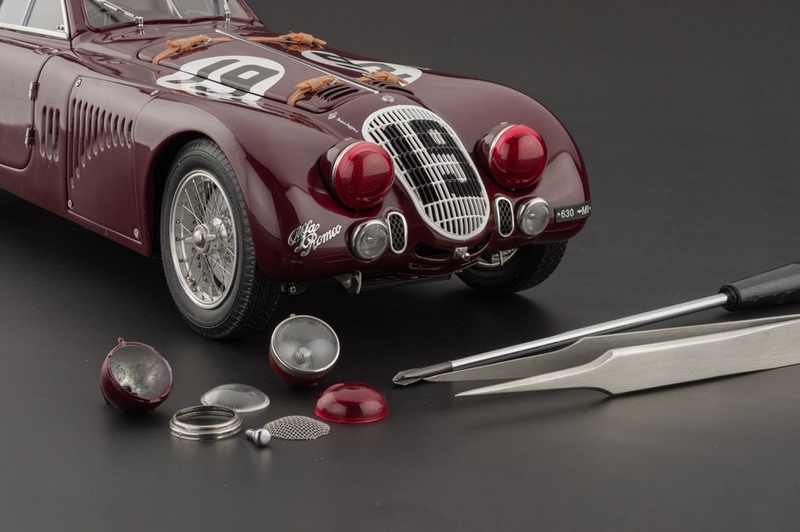 This year, CMC received the very coveted award “Super Model of the Year 2015 “, (each category combined) for the 1938 Alfa-Roméo 8C 2900B Coupé Speciale Touring Le Mans version at 1/18 scale ! Congratulations CMC, and thank you to all voters and contenders. For the upcoming 24 Hours of Le Mans in 1938, the racing department of Alfa newly founded “Alfa Corte” was particularly motivated; they wanted the win! A 8C 2900 B with special bodywork and a performance engine should allow this project. The renowned coachbuilder Fa. Touring you can customize in the famous lightweight Superleggera as an aerodynamically shaped knowledge, closed body (Berlinetta). As a result, there is a stunning and yet very futuristic Released by Bolide ready for the start. The experienced team of drivers for long haul Renne, Raymond Sommer and Clemente Biondetti went with the starting number. 19 in the race battle at La Sarthe. Never before in the Le Mans racing history, a vehicle has the race as dominant and superior dominated as the 8C 2900 B Speciale. In the 20th hour of the race led the Alfa Corte – team already with 11 laps or about 160 Km edge over the entire competition the field, burst than at top of right front tire. Pilot Raymond Sommer was able to intercept the car, keep on track and reach the boxes. There was found that tire parts have damaged the engine mount and engine oil was lost. Nevertheless, Clemente Biondetti dared still as a leading team once again back on track, but he had after only two rounds finally give up with valve damage. Thus ended one second to the other one already sure Felt victory in disaster. 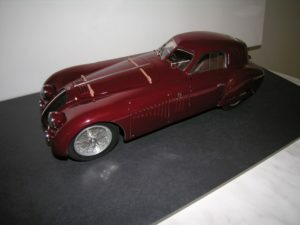 Le Mans 1938 was the only appearance of the 8C 2900 B Speciale with the Touring Superleggera body. In 1911, Nicola Romeo, an industrialist from Milan, took control of the company and, shortly after World War I, turned it into a public company, the Alfa S.p.A., which was changed to Alfa Romeo subsequently. From 1920 onwards, the name “Romeo” was incorporated into the company logo, and a four-leaf clover was also added to the company trademark. During the 1920s and early 1930s, the reputation of Alfa Romeo was comparable to that of Bugatti, which was widely acclaimed at the time. Both makes were synonymous with the most exciting, beautiful, and fastest sports cars of the era. 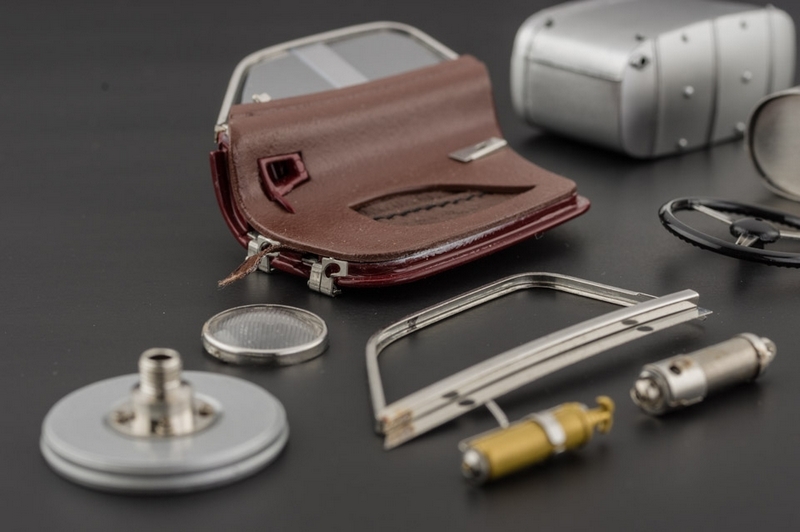 The Bugatti models were born of individual creation by a master, such as Ettore Bugatti, the great “Le patron,” and later his son Jean. Each new Bugatti was first crafted as if it were a work of sculpture: the designer-sculptor “chiselled away” what was undesirable little by little, piece by piece until every part of the car looked breath-takingly elegant. 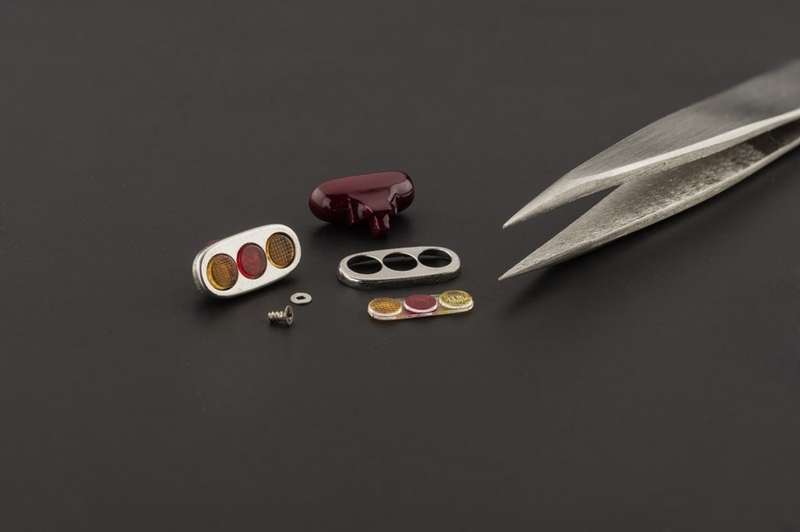 In contrast, the development process was different at Alfa Romeo, where each new model grew out of collective efforts made by a team of talented engineers and craftsmen. Of course, ingenious virtuosos like the legendary Vittorio Jano were granted a greater freedom of creative expression, which made itself felt in the cars that rolled off the factory. The Alfa Romeo models were just as marvellously stylish as their famous counterparts from Molsheim. They were also easier to drive and negotiated curves at a greater speed with less noise and demand of efforts on the pilot. Vastly superior to their French competitors, they also started readily in winter months. Alfa’s racing successes during this period were attributed to the development of four famous series: P2 (P3), 6C 1500-1750, 8C 2300, and 8C 2900B. They served to establish Alfa as a leading automotive make during the 1930s. At the 1924 Grand Prix, Alfa Romeo introduced its newly-developed P2, a 2-litre straight-8 race car with double overhead camshafts, and it won a sensational victory on debut. 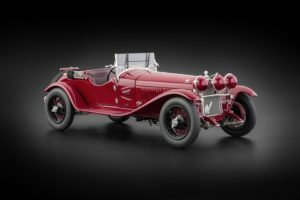 This historic vehicle would maintain its winning record continually to become an iconic car of the 1920s, and it exerted a profound impact on the development of GP race cars. The P2 remained almost unbeatable during this period. An uprated P3 took over during the 1930s, and with Nuvolari at the wheel, it also scored one victory after another in GP racing. Designed after the successful P2 by ingenious Vittorio Jano, the legendary 6C series was launched in 1927. It began with the 6C 1500 and ended with the 6C 1750 GS, otherwise known as the Gran Sport version. 1929 saw a 6C 1750 finish first at Mille Miglia. 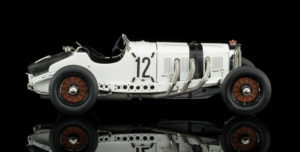 In 1930 Nuvolari drove his 6C 1750 GS to championship at Mille Miglia. In the contest of the Irish Tourist Trophy, Nuvolari, Campari and Varzi from the Alfa Romeo team braved the torrential rain to finish 1st, 2nd, and 3rd. The 1750 was the crown jewel of the 6C series. Only the 24-hour endurance race of “Le Mans” proved to be too much for it. At the end of 1930, the 6C 1750 was succeeded by the 8C 2300, a model that would become just as victorious and famous as its predecessor, if not more. At first glance, it looked like an enlarged 6C 1750, but under the elongated bonnet was a straight-8 engine with a side-mounted compressor rather than a frontal one, as in the 6C 1750. The 8C 2300 was a power house. Its racing version was bored out to 2.6 litres, delivering an output of 165 hp and a speed up to 200km/hr. In the early thirties, the 8C 2300 was the king of the racetrack. In Grand Prix races, they outperformed Bugatti’s to win the title repeatedly until the Silver Arrows of Mercedes and Auto Union came on the scene. In retrospect, the 8C 2300 won the 24 Hours of Le Mans in 1931, 1932, 1933 and 1934. 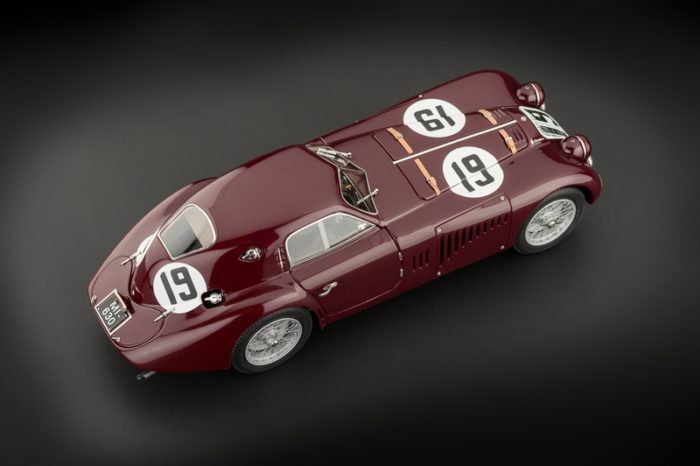 The years 1932 and 1933, in particular, witnessed the 8C 2300 score a sweeping victory at Le Mans twice, claiming the first, second, and third places each time. 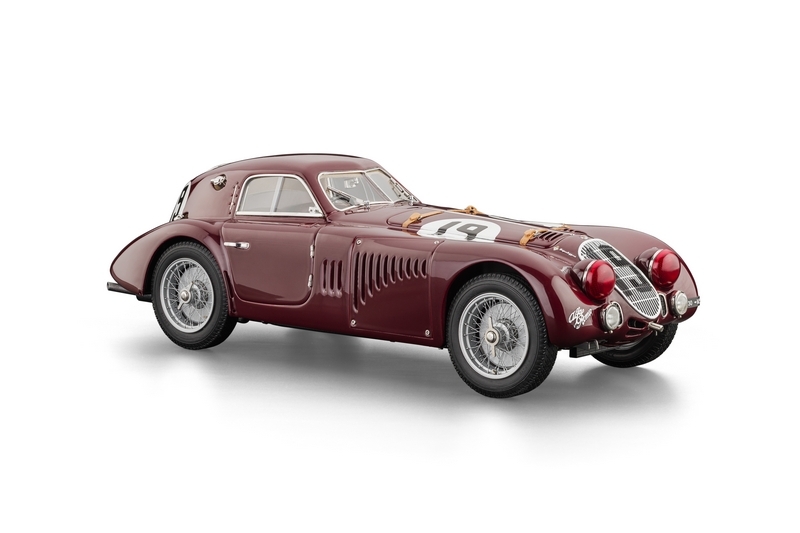 Meanwhile, the 8C 2300 also dominated the prestigious Mille Miglia race year after year. By the mid-1930s, however, the glory of Alfa Romeo was in danger of fading away. Its rigid axial engineering and cable brakes were getting outdated and could no longer measure up to the latest advance of technology. 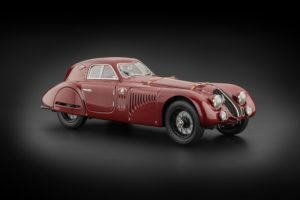 To catch up, Alfa Romeo developed in 1937 the 8C 2900B, an entirely new model. Powered by a straight 8-cylinder engine, it boasted an output of 180 hp that could sustain a speed of 200km/hr. The vehicle adopted an all-round independent suspension, unbelievably reliable hydraulic brakes, and other cutting-edge features that greatly enhanced its maneuverability, velocity, and safety. Only one thing was missing — the old Alfa aerodynamic styling. Many people thought the 8C 2900B was too big, too “plush,” and too much of a business-like roadster. In spite of this, the new model exhibited a spectacular capacity of triumphing on racetracks. 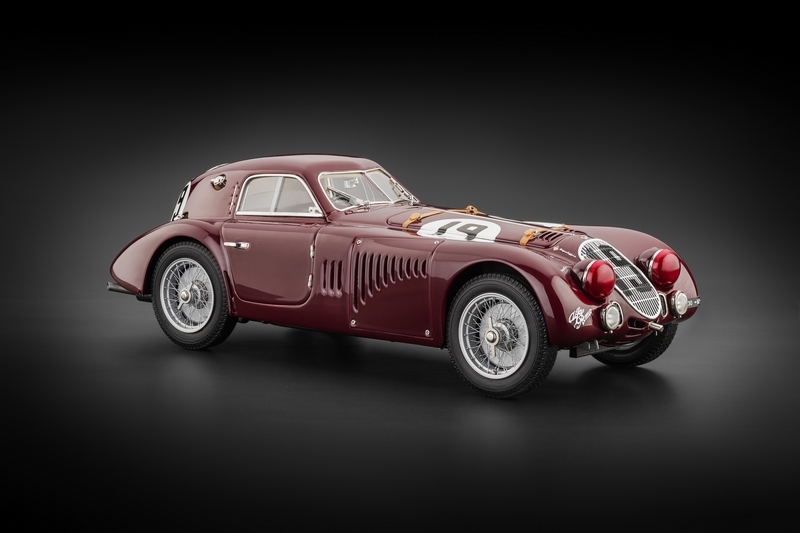 The 8C 2900B clinched the 1st, 2nd, and 3rd places at the 1938 Mille Miglia. In the course of his successful run for the championship, Clemente Biodetti also set up an amazing new world record, covering the 1635 km of the race at an incredible speed averaging 135km/hr. The newly-founded racing department “Alfa Corte” was now highly motivated to do well in the upcoming 24-hour endurance race of Le Mans, and they must get a race car ready that was good enough to compete and win at Le Mans. 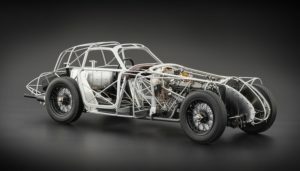 It occurred to them that an 8C 2900B fitted with a coach-built body and a more powerful engine was all they would need. The renowned coachbuilder Touring was contracted to build for this car a close-top (Berlinetta) body based on its patent expertise that features an aerodynamic contour and lightweight construction known as “Superleggera.” The result was a breathtakingly beautiful and futuristic-looking race car. Its two front fenders were integrated into a wholesome configuration of the body. Behind the front wheels were two removable panels for quick access to the engine. Equipped with two Roots superchargers, the 2.9-litre eight-cylinder inline engine was capable of yielding an improved maximum output of 220 hp and a top speed of 245km/hr. A veteran team for long distance racing, Raymond Sommer, and Clemente Biondetti took off with starting No. 19 at Sasthe. In Le Mans’ racing history, never had a vehicle obtained such a dominant and superior lead as the 8C 2900B Speciale with the Touring Berlinetta body did that day. In the 20th hour of the race, the 2900B was leading by 11 laps or 160 km ahead of the next best competitor and was seemingly safe from any challenge, when its right front tire burst. Raymond Sommer managed to bring the car under control and stay on the track before making a pit stop. It was found that the ruptured tire had caused damage to the engine mounting bracket, and there was an oil leakage. Refusing to give up, Clemente Biondetti drove the car for two more laps until a damaged valve compelled them to call quits. Such is the story of how the longest lead of all times in Le Mans’ history came to a disastrous end, and why an apparently certain victory got lost. The Alfa Romeo 8C 2900B that raced at the 1938 Le Mans was the only one of its kind that was fitted with a Touring coach-built body. After World War II, the vehicle changed hands several times, and it eventually wound up in England. In the 1980s, the Alfa Romeo Storico Museum brought it back home to Italy. After a thorough restoration, the vehicle was reinstated in an optimal running condition. There is no doubt that the 8C 2900B is one of the world’s most valuable pre-war cars, and as an epitome of Alfa Romeo’s glorious racing history, it is also a priceless asset to the Alfa Romeo Storico Museum. 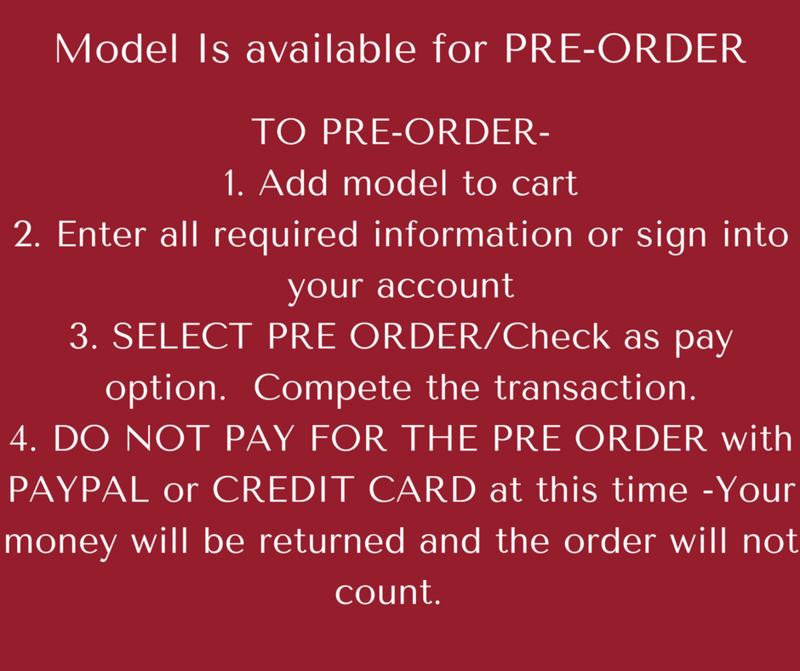 As a manufacturer of high-end model cars that is licensed to replicate the 8C 2900B, CMC would like to acknowledge the generous support and advice of the Alfa Romeo Storico Museum in the development of 8C 2900B replicas. Sincere thanks are also due to the director and staff of the Alfa Romeo Storico Museum in Arese, Italy, who have made the aforementioned support and advice available to us. 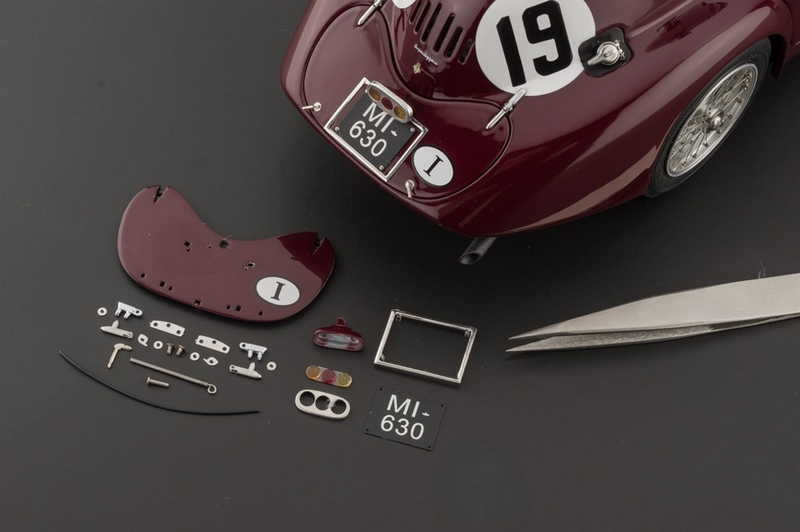 With the advent of September 2014, CMC was ready to start producing M-111 – a replica of the 1938 Le Mans version of the Alfa Romeo 8C 2900B. On September 4, however, a message came from Dr. Stefano Agassi, Director of the Alfa Romeo Museum, that informed us of certain newly-discovered information on the 8C 2900B. 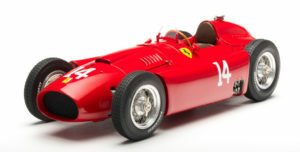 M-111 is meant to replicate the 8C 2900B with starting number 19 that raced in the 1938 24 Hours of Le Mans. It features considerable modifications of the street version manufactured and marketed by CMC as M-107 earlier. 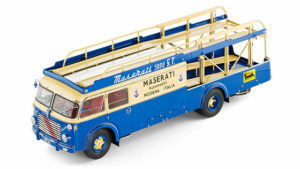 Among the modifications are an entirely new hand-made grille, a bonus lever jack for pit use, additional front and rear license plates, elongated oil and fuel fillers so that their seal rings and metal caps protrude above the car body, knock-off nuts of a different shape, and the addition of such accessories as a fire-extinguisher inside the left door, an engine-starting crank, meshed protective nets of the headlights that are fitted with removable red-tinted covers, and so on. 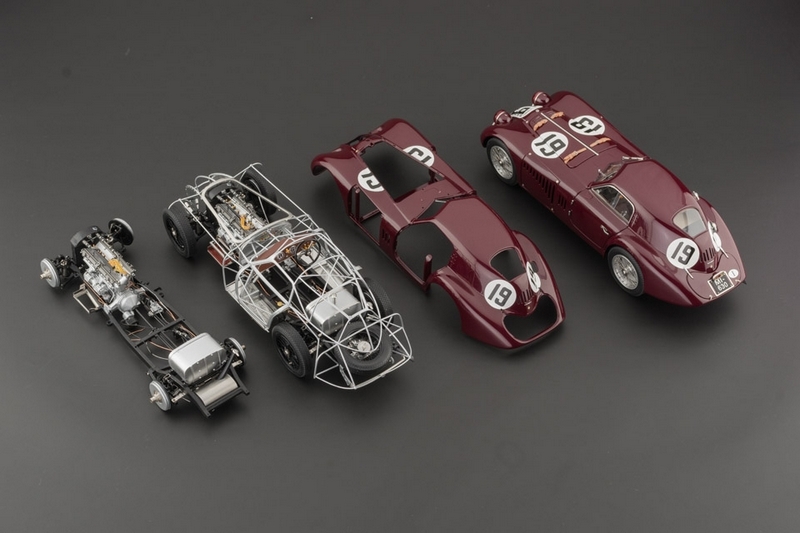 All of these features had been incorporated into CMC’s newly-developed M-111 prototype, when Dr. Agassi called ou attention to the following two features that had just been uncovered and were peculiar to the Le Mans 8C.